Another adventure from Beachbum Berry’s Grog Log. I just felt like breaking out the tiki mug. The Pusser’s website has the history of this drink — can’t say it’s all that exciting (bartender makes drink; another bartender tries drink; a mix-off develops; hangovers ensue; etc. etc. etc.) 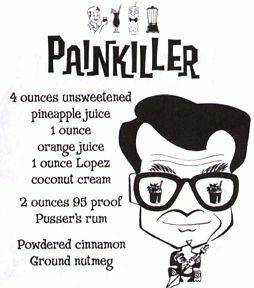 — but it’s fair to say you can’t make a true painkiller without Pusser’s, a heavy, aggressive (95 proof) navy rum from the British Virgin Islands. Blend without ice and pour into tall glass or tiki mug filled with crushed ice. Top with a shake of nutmeg and a pinch of cinnamon. Garnish with pineapple stick, orange wheel and cinnamon stick. Somewhat on the sweet side, as you might expect (it is, after all, a tiki drink), but not cloying. It might pay to cut down the amount of coconut cream by half, and replace it with coconut milk, to reduce the sweetness while keeping the coconut bounce. And I know what you’re probably thinking — swap the Pusser’s for a less assertive gold rum, 86 the OJ and twiddle with the proportions, and isn’t that a Pina Colada? Well, yeah, pretty much. But before you write off the Painkiller, take a crack at Pusser’s and see how much this mighty sailor’s rum can change your perspective of the old PC.